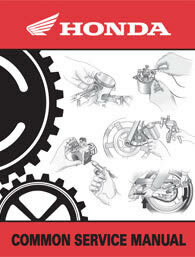 The Honda Common Service Manual is part instruction manual, part technical reference manual, and part service manual. As such it helps readers understand mechanical, hydraulic, and electrical fundamentals, learn the function of components, and perform troubleshooting and servicing procedures. The manual will be especially useful to those who want to work on their own vehicle and to help prepare those who aspire to a career as a powersports technician. The manual includes information on all systems on all Honda powersports models (motorcycle, scooter, ATV, Side-by-side, and PWC) and covers all model years.